It has been several weeks since I last crawled underground into the plumbing system of the pond to clean out the leaves. Autumn and the strong winds blew a lot of debris into the pond, and it seemed like a good time to empty the leaf traps and flush out the biologic filters. This afternoon is perfect for this job. The system is now clean, and I climb up the stairs from below the water level, out of the vault that sits adjacent to the pond. Above me is the half-finished gazebo, where I still have to install seats and finish the columns and walls. 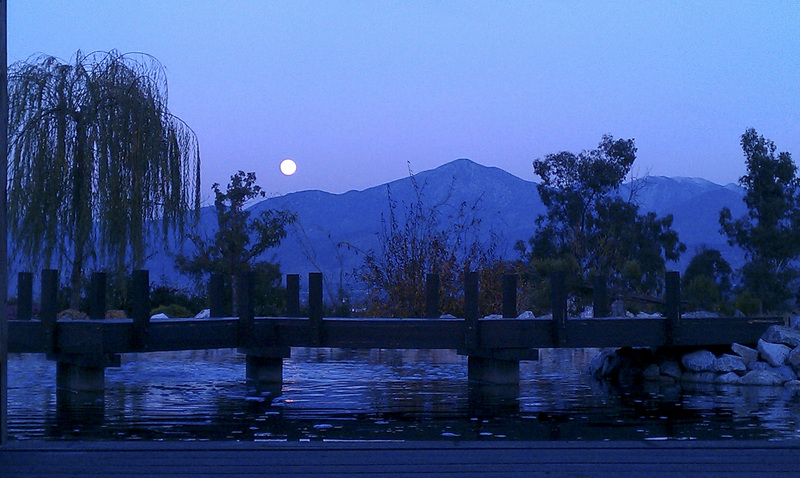 With my head just above ground level, looking east, the full moon is rising just to the north of San Bernardino Peak. The nearly completed bridge, waiting for railings, snakes across the pond surface. To my surprise, this camera phone (HTC Inspire) shot turns out better than expected.